The Tripura CPI(M) took out a protest rally in Agartala, the State capital of Tripura, against alleged organized attack by ruling BJP-IPFT on the opposition candidates who wanted to file nomination papers for the coming by-election to the vacant Nagarpanchayat and Municipal Council seats. 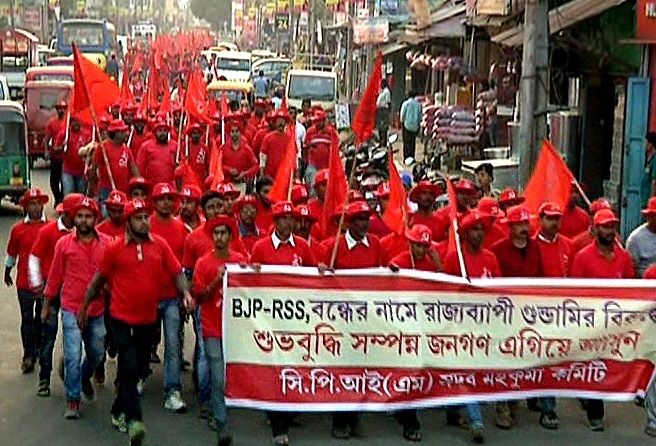 The protest rally, which started from the Paradise Choumhuni area, went through the streets of the capital city and the protesters with CPI(M) party flags raised anti-BJP-IPFT slogans. Former Deputy Speaker of Tripura Legislative Assembly and Ex-Minister Pabitra Kar, who led the protest rally, said that at various places in West Tripura, South Tripura, Khowai and North Tripura districts, the CPI(M) candidates were attacked and terrorized by the ruling party supporters and leaders so that they either fail to submit nomination or withdraw their nomination. Several vehicles of the Opposition party candidates and leaders were also attacked and destroyed in various parts of the State including Jirania of West Tripura. Those vehicles were used during the filing of the nomination papers for coming by-election scheduled to be held in the end of the month.